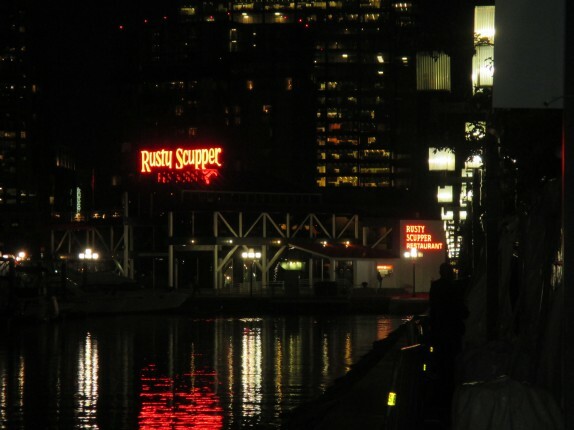 During our visit to the Inner Harbor of Baltimore, Maryland, we really had no purpose other than to visit a book festival that was taking place that weekend. 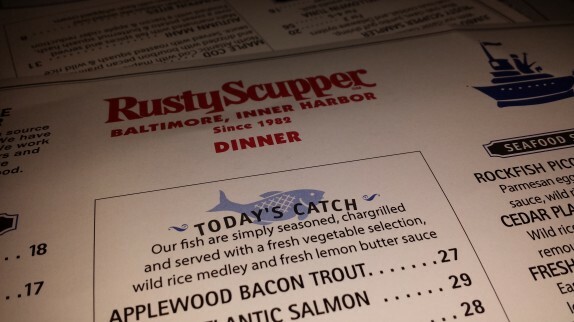 During one evening stroll, before heading back to our hotel room, we thought we’d visit one of the restaurants on the harbor, the Rusty Scupper. Neither of us were very hungry, but there was little near our hotel, so seafood sounded like a fine choice. 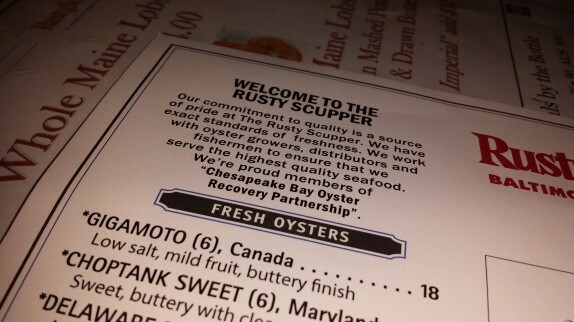 Plus crab and Maryland are pretty much synonymous. Inside, the appearance is a bit dated but not unsanitary by any means. 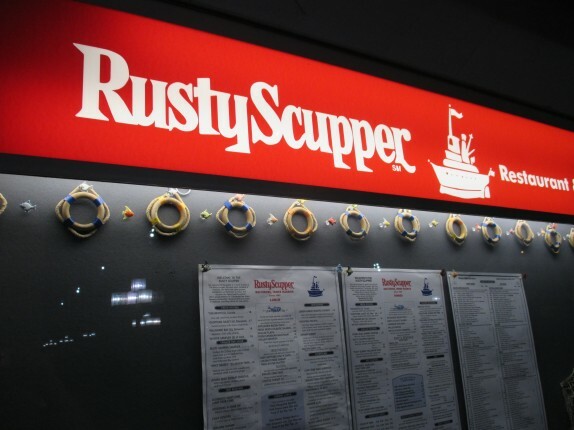 It looked like a place that is tried and true and that would appeal to an older crowd; it reminded me a lot of seafood restaurants with my parents in Coney Island in the 1980s. 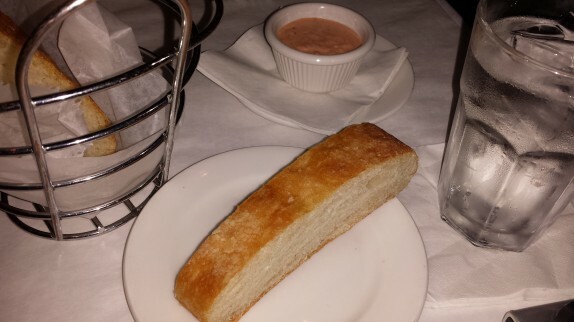 The bread for the table was served with a very strong garlic puree. 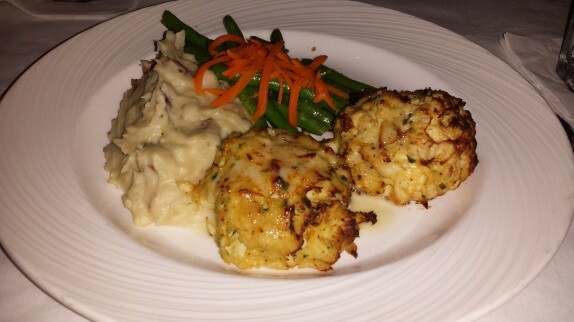 I really wanted to try their crab cakes, and the lump crab cake ($18 – With lettuce, tomato. 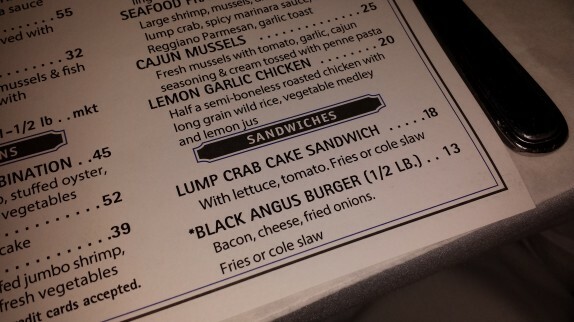 Fries or cole slaw) sandwich seemed like it would be a decent portion. Then I glanced further up the menu at the Authentic Maryland Crab Cake entree ($36 – Lump crab cakes lightly broiled with three mustard butter sauce served with mashed potatoes and fresh vegetables), and mistook the placement of the word “three” and settled on that after confirming that only one 4 oz crab cake was on the sandwich. I thought I’d be tricking the system by paying twice the price and getting triple the crab cakes, but, again, I made a mistake. 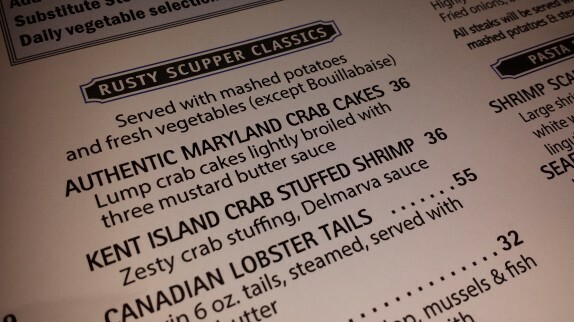 It wasn’t three crab cakes, it was a sauce with three mustards. 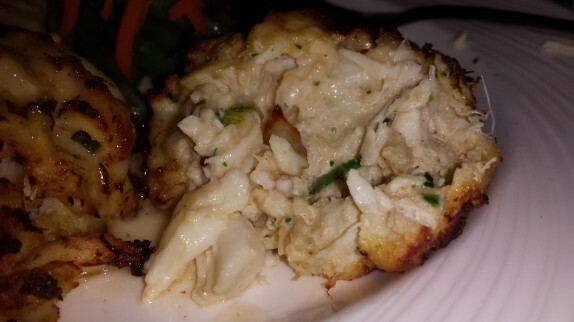 These crab cakes were broiled, which I should have expected. The three mustard sauce was barely detectable, and I’m fine with that as the lump crab was the star on the plate. 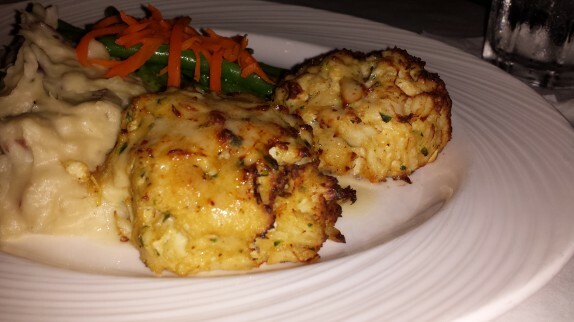 These crab cakes were moist and not heavy at all. The seasoning was slightly lacking. Each was four ounces, which is a good size. The exterior had a slight crunch; I was hoping for something a little crisper. The mashed potatoes weren’t spectacular, but the sauteed green beans and julienne carrots were great, possibly the best seasoned bites on the plate. The service was good as well, and it was serene and relaxing to have a meal on the harbor close to sunset.